You would imagine that the Maasai women of Olepolos village in Southeast Kenya would be blessed by living just underneath Mount Kilimanjaro. Unfortunately, that was not the case as far as access to water was concerned. 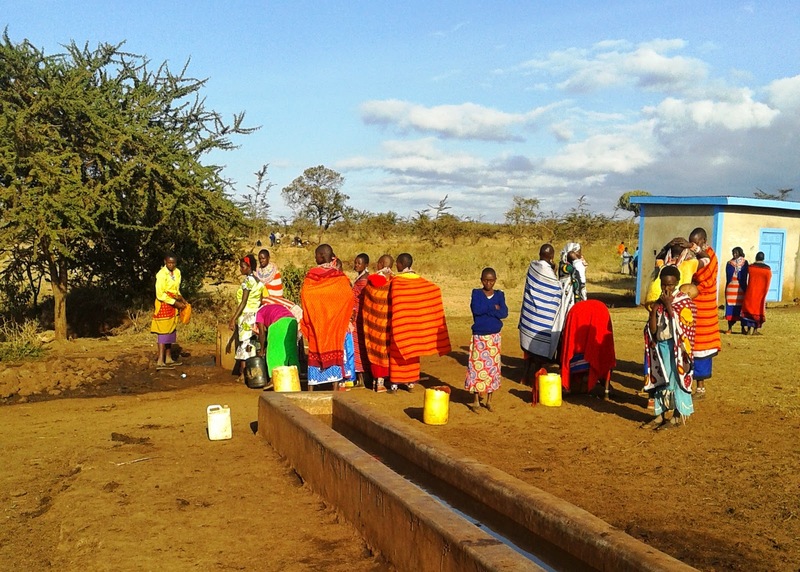 Until recently the women in the village had to hike a 30-km round trip up the mountain to the forested slopes on the Tanzanian side of the border to collect fresh water from a stream. But yesterday was a happy day in the village as it saw the inauguration of a water bore hole constructed by Water is Life Kenya thanks to co-funding from the Rotary Foundation (Rotary Clubs of Muthaiga, Kenya, and Dover Colonial, USA). I was privileged to be invited by Joyce Tannian, Director of Water is Life Kenya, to the opening ceremony of the new bore hole. I know Joyce from singing together in the Nairobi Music Society choir, so it was very interesting to discover that water management was another important side of her life. The ceremony featured songs, dances and lots of speeches! Joyce sang and got rewarded with a complete beaded Maasai dress and numerous bead necklaces strung by the Maasai women of the village. The representative of the Muthaiga Rotary Club, Wafula Nabutola, got a live goat! After four hours' road drive from Nairobi to the town of Oloitoktok, another hour of dusty, hilly and pot-holed tracks up Kilimanjaro to reach Olepolos village, and over two hours and a half of official ceremony, it was very comforting to be served an enormous plate of simple but heartening and nutritious food: rice, braised cabbage, two pieces of goat meat, three pieces of chapati, a quarter avocado, half a banana and a slice of orange. Water is Life Kenya has drilled a water borehole; it is connected to a cistern, which in turn feeds water into two taps. The project also delivered additional separate men's and ladies' latrines, and a livestock water trough. The villagers and Joyce told us how this infrastructure had revolutionized life in the village. Although the women are still lugging jerrycans of water on their heads and backs, they do not have to walk as far to get it as before. This frees up a lot of their time which can be put to more productive use. Furthermore, the bore hole has now become an active community site where news is exchanged and business transactions concluded. Two women have set up stalls to sell produce there; another sells hot tea and cooked food. An entrepreneur has even erected a hut for a small grocery store next to the bore hole taps. The water bore hole has thus transformed a dry savanna spot into a vibrant community site.